It’s time for another Source4Women challenge! If you’re unfamiliar with Source 4Women, it’s a community created by United Healthcare that provides healthy living information on things like nutrition exercise, health screenings and more for women. Every month they do a photo contest to encourage you to live a healthy and active lifestyle.This month’s Source4Women photo challenge is all about eating fresh veggies and the challenge is to upload a photo of your favorite veggies. If you follow me on Instagram, you’re probably aware that I’m in the middle of a Whole30 challenge right now. This is my third time doing it and I’ve been posting my daily food updates. The primary focus of the Whole30 is to just eat real food (meat, veggies, fruit, and nuts) so I’ve been getting plenty of veggies in my diet these days! 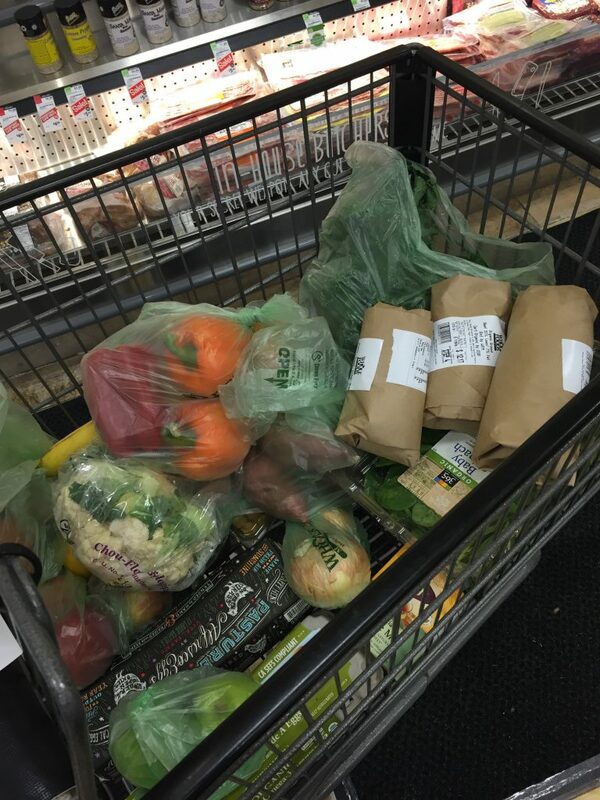 Mmm…a cart full of veggies. The photo is a picture of me shopping for food the night before our Whole30 challenge began. As you can see, there are plenty of fresh veggies in our cart! This time our Whole30 is a family affair with my husband joining me. Baby Awesome is also indirectly joining because she is breastfed and eats whatever I eat. Now it is more important than ever for me to be eating as healthy as I can because I’m eating for two. Bring on the veggies! Every month there is a prize on the We Dare You site valued at $400. In addition to this, you have the opportunity to win an additional prize by entering through Fit & Awesome. This month we’ve decided to give away a $100 Gift Card to Whole Foods! Why? Because eating veggies is always easier when you have access to produce. If you don’t have a Whole Foods in your area and you win, then we’ll send you a gift card to a healthy grocery store of your choice. I love beets, sweet corn, red bell peppers and parsnips! Mmmm…have you ever had parsnip mash? It’s really good! My favorite veggies change with what’s in season, but I like zucchini best. You’re welcome. Zucchinis are great! I am a huge Whole Foods fan! I get so happy when I bring home a bag full of fresh veggies from WF or the Famer’s Market. What a great giveaway! Whole Foods is a great place! All those veggies would be good in a frittata! I love carrots and cucumbers the most. Carrots. I can’t get enough, actually. I’m terrible about my veggies but I love, love, love carrots! Oh yeah, it’s a great store! I love zucchini and other squash! I like Lima Beans, corn and most other vegetables. I like a variety of vegetables and usually pick ones based upon my main dish but I do have to favorites…Broccoli, asparagus, sweet corn and greens like kale and arugula. A couple of my favorites are spinach and beets (as long as the beets aren’t pickled) I don’t care for vinegar flavor. Have you tried golden beets? They are great and no pickled flavor. My favorite veggies are broccoli, cauliflower, corn, spinach and carrots! I love them all! Those sounds like they could be ingredients to a delicious summer salad! Brussel sprouts and broccoli are my favorites. I submitted a photo but I did not see a place to enter a promo code. The promo code should be where you uploaded the photo. If you want to send me a link to your image I’ll make sure you get added to the giveaway properly. My favorite veggies are artichokes, tomatoes, fennel!! I love steamed cauliflower, broccoli and asparagus and I also like cucumbers. Elle, have you ever tried cauliflower mash? I love spinach, peppers, broccoli, and kale. My favorite veggies are tomatoes, cucumbers, squash, and broccoli. I love broccoli and corn.